News of the untimely death of sarangi master Dhruba Ghosh took me down some fascinating listening paths yesterday evening. These included the 2005 disc seen above featuring Dhruba Ghosh's older brother Nayan Ghosh titled Naghma - which is the Farsi and Urdu word for 'melody'. 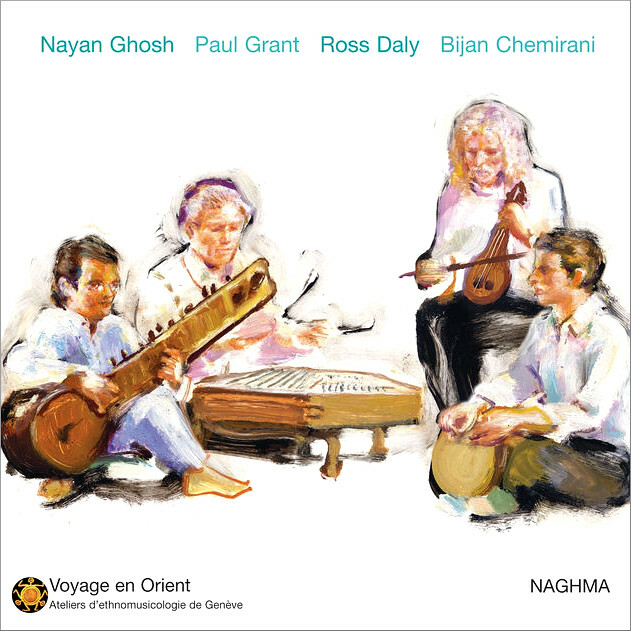 The musicians on the album artwork are from left to right Nayan Gosh (sitar), Paul Grant (santoor), Ross Daly (Cretan lyre) and Bijan Chemirani (zarb). The geographic reach of the music ranges from the Himalayas through Northern India to Kashmir, Afghanistan, Persia, Turkey and Crete, and includes a composition by Nayan Ghosh based on a traditional boatman's song from the Bengal-Ganges Plain. Every CD tells a story through its music, graphics and sleeve notes, and that intangible but crucial narrative - which touches on the cultural, emotional and personal - loses much when the music is reduced to the postmodern bits and bytes of streaming and downloads. It is well-known that a few celebrated musicians including Olivier Messiaen and Alexander Scriabin were synaesthetes. But the latest neuroscientific research into multi-sensory neurons suggests that synaesthesia - cross talk between the human brain's sensory channels - is not as rare as commonly thought. In fact it is part of the human condition and the five senses of taste, sight, touch, smell, and hearing often exhibit considerable overlap. So it can be postulated that when a musical experience is confined to the single sensory channel of sound, as is the case with download and streaming, vital sensory crosstalk is lost. Which may well explain why the CD refuses to die, why vinyl sales are booming, why live music - which is multi-sensory - always sounds better than recorded, and also why the market for the mono-sensory eBook is in decline.